Recently the idea of a "homeless resource center" has been floated as a solution to the homeless problem. Ask almost any homeless-service provider in Hawaii what the most effective solution to solving chronic homelessness is and they will tell you that the concept is "housing first" -- permanent supportive housing. Homelessness has become so widespread since the 1980s that it is tempting to jump to a solution. But before we invest in any resource, let's make sure it will solve the problem. One practice solution that has been successfully tried on the mainland is called Housing First. The Housing First model contends that people have a right to housing and that people do not have to be "housing ready" to live in housing. After all, many of our neighbors have problems and yet live successfully in housing. The Housing First model has demonstrated that once someone is in a home, they may have renewed hope and motivation to change their behavior. Even if not, it is more effective to get these individuals off the streets and out of shelters where they revolve in and out of the emergency service door. 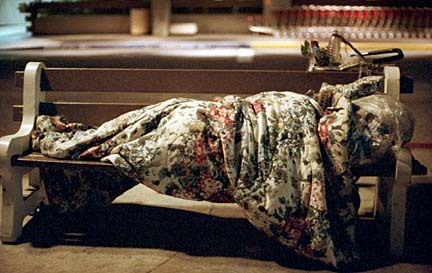 A homeless woman sleeps on a bench at the Honolulu airport. Actually, we have no choice. We all see the growing problem of widespread homelessness. We are currently at gridlock in terms of shelter space. We have no space to take new people in. Rather than creating additional shelter space, which is just a Band-aid for the problem, let's invest in the Housing First solution. Housing First has two components: permanent housing and the expanded case management to help the individual live in the housing. Let's tackle the real problem, the way they are in cities around the country, and create permanent supportive housing. The majority of people who become homeless are being helped out of the situation fairly easily. There is a small group of homeless, many of whom are involved in heavy drug use, who don't want any help. But there is yet another group of individuals who are chronically homeless; they have been living in the streets, parks and shelters for long periods of time. The Culhane study reports that although people in this group make up only 10 percent of the homeless population, they use 50 percent of the resources, primarily because they are so difficult to help. By focusing on this relatively small group, we can make a huge impact in solving (not merely Band-aiding) the homeless problem. It has been demonstrated that the chronically homeless can be placed from the streets and shelters and live successfully in housing that is enriched with the services they need. Getting these people placed will break the gridlock and will make room for others living on the streets until they, too, can be placed. This solution to chronic homelessness is being promoted by industry experts as well as by the Bush administration. In fact, a number of federal initiatives have been offered recently to states incorporating permanent supportive housing, and this preference is expected to continue. Hawaii once again will lose out on federal funds if we do not get with the program -- the permanent supportive housing program. Lynn Maunakea is executive director of the Institute for Human Services in Honolulu.